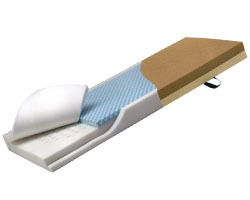 The Reduce Max Pressure Redistribution Mattress is designed for patients at risk of developing pressure ulcers and for treatment of Stage I and II wounds. With Patented Anatomic Zoning, the mattress consists of five distinct pressure zones to redistribute weight and reduce overall pressure. A built-in lumbar support helps reduce lower back pain. The mattress is designed with the Heel-Ease® unique heel slope which redistributes and reduces pressure in the critical heel section. The low moisture, vapor permeable, 4-way stretch cover facilitates cleaning and patient comfort. Also available with a raised 2” side bolster to help keep patient centered and reduce fall risk.